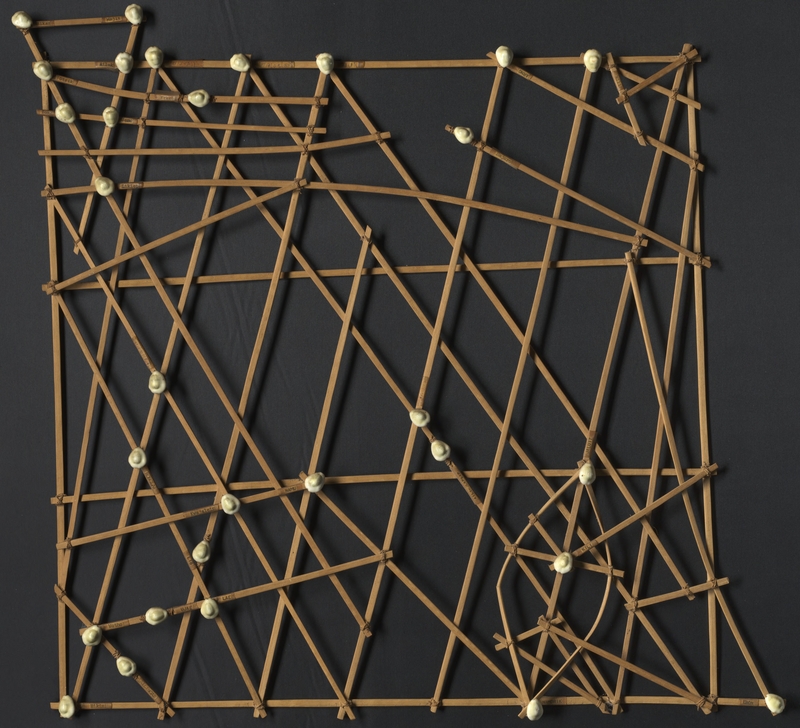 Micronesian stick charts were used by seafarers to cross great distances of water where land sat below the horizon, frequently invisible. To gather information for each chart, a sailor lay in the bottom of his canoe gauging the complexity of swell and wave patterns through the movements of the boat. Onto a lattice of coconut or palm fibres they bound small stones and shells, plotting the islands and atolls in an area of Pacific Ocean. Each line of the chart was manipulated to represent shadow phenomenon — reflection, refraction — and several other ancillary wave actions: straight lines for currents (which were reliably recordable) and bent bands for swells (less predictable). A chart was created as if the sailor were at once high up, looking down for a total view, and deep below the surface of the water on which he floated. Far from being crude, this form of cartography is a complex simulation of knowledge that is both concave and convex; it is under and over direct experience. These maps are subjective and beautiful. They are harmonious projections, not abstractions. Once completed, a chart was not taken onto a boat, it was memorised. Bryony Quinn is researching digression and writing about attention.